ACE Soccer Club: The ACE Soccer Club offers teams for five different youth levels (U10, U12, U13, U14 & U15). The 25-acre soccer complex is located northwest of the intersection of Highway H and Adams Road in Caledonia. It includes six playing fields, a gravel parking lot, concession stand, portable restrooms, and a stormwater management pond. For more information call 262-732-4049, or visit http://www.acesoccerclub.org/. Browns Lake Golf Course: This golf course has a total of 6,449 yards, and a long history of 90 years. The Browns Lake Golf Course is the host of various tournaments and also offers a number of outings throughout the year. Other attractions are the Golf Shop, the Fairway Cafe, or the practice area with two putting greens, a chipping green, and two bunkers. For more information call Chad Wilks at (262) 763-6065, or email him at chad@brownslakegc.com. You can also visit the website on http://www.hhfairway.com/site/index.php/Welcome_to_Browns_Lake_Golf_Course. Burlington Youth Soccer Club: At the BYSC, everything is about having fun, while learning the great game of soccer: "Learn how to play this game through Fun Filled Recreational Teams or the Developmental Program Teams working to feed the High School Soccer Program." The BYSC has its complex at Bushnell Park, Burlington, WI. It offers one lighted, and one regular soccer field, two practice fields, one U11/U12 field, one U9/U10 field, two U7 fields, two U6 fields, as well as three U5 fields, and an In-House U8 facility. For more information visit the website at http://www.burlingtonsoccer91.org/index.html. You can also call or email Sandy Cowan at 262-763-7224 or akcowan99@hotmail.com. Pershing Park: This park offers spectacular views of the lake and harbor. The park offers a lighted regulation football field with bleachers (Pershing Field), skateboard park, lavatories, concessions, picnic tables, public boat launch with car/trailer parking and shore fishing. Next to Pershing Field, the park also offers a softball/baseball diamond, as well as a soccer field. The park is located on 700 Pershing Drive, Racine. For more information, call (262) 636-9232. Haban Park: This park is especially interesting for the baseball and softball fan. It is located on 1900 Borgart Road, Mount Pleasant, and offers a combined total of 12 softball and baseball diamonds. Additionally, the park also includes six football/soccer fields and more open space for activities. The sports facility is owned by the county and operated by Racine Youth Sports. For more information call (262) 886-0797 or visit the Racine Youth Sports website at http://w.mawebcenters.com/racineyouthsports/. Horlick Field: Horlick Field, 1648 N. Memorial Drive, is the home field for the Racine Raiders semi-professional football team. The NFL&apos;s Chicago Bears played its first game ever as the Bears at Horlick Athletic Field against the Horlick-Racine Legion on October 1, 1922. The Bears won 6-0. Teams from the high schools and local leagues play their regular season games in the baseball diamond, which is the site for local tournaments and championship games. The stadium capacity is 8,500. For more information visit the Racine Raiders website on http://www.racineraiders.com/. Humble Park: Humble Park, 2300 Blaine Avenue, Racine, WI, offers a great variety for people that want to stay active. The facility offers two baseball diamonds, of which one is lit and allows night play, another lighted softball diamond, three tennis courts, one outdoor basketball court, and one outdoor sand volleyball court. Additionally, the venue has a gymnasium, meeting rooms, playground area, preschool room, as well as a concession area and lavatories. J.I. Case High School: 1966 built high school is located in southwest Racine, on Washington Avenue, and is home of the Eagles. The sports complex includes one pool, two soccer fields, two football fields, two practice fields for all sports, one non-WIAA approved track, twelve tennis courts, two softball diamonds, one baseball field, a fieldhouse, and an adapted sports area for wrestling and miscellaneous sports. If you like to get more information on possible field usage, visit the website at http://case.racine.k12.wi.us/, or call (262) 619-4200. Lockwood Park: James E. Lockwood Park, 4500 Graceland Blvd., Racine is a great place to play a variety of sports. The park offers a total of nine tennis courts and four basketball courts. It also includes a couple soccer/football fields, as well as a lighted softball/baseball diamond. After updating the facility, the complex also holds a community center and children&apos;s play equipment. For rental information, call (262) 636-9232. Beachside Oasis: The Oasis is located, just as the name tells you, at North Beach, Racine, WI. This place is excellent if you enjoy the sun, good food, and especially beach volleyball. A total of twelve volleyball courts should assure for a lot of playing time, however they are available on a first come basis. 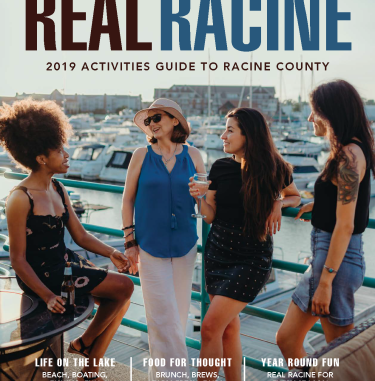 The site is overseen by the Racine City Department of Parks, Recreation and Cultural Services. 262-636-9131. Racine Country Club: The Racine Country Club is mainly known for its golf course. However, it also provides a high-quality tennis facility, with a total of six outdoor courts, of which two are lighted and heated platform tennis courts with a courtside warming house. A variety of social events and tournaments are hosted throughout the season, including family, junior and adult events. For more information call 262-637-8008, or visit http://www.racinecountryclub.com/. Racine Soccer: The Racine Area Soccer Association (RASA) provides a lot of different programs for every taste. The youngest players 3 years of age can get their first soccer experience in the Small & Speedy Program, while the Superstars Program is specially designed for those players who face a variety of disabilities. The Recreational League Program offers the opportunity for children ages 4 years old and up to learn, play, and enjoy the game of soccer. As a total, the (SCORe) complex offers 46 acres of space, an additional 12 acres practice fields, as well as 8 fields in Franksville Park for recreation teams. For more information, visit http://www.racinesoccer.com/ or call 262-898-1092. Racine Tennis Club: The Racine Tennis Club is located on 5100 Briarwood Lane in Racine, WI. It offers a total of five indoor courts and is also hosts seasonal tennis camps and a USTA Tournament.